The manuscript deals with the dynamic interaction between the seismic response of a masonry bell-tower and the soil layer below its foundations. The study is based on a direct soil-structure interaction analysis, by means of a complete 3D FEM model in which, beside the non-linear behaviour of the masonry material, a large portion of the foundation soil is taken into account, assuming a condition of non-reflection of the elastic waves within the domain of interest by means of infinite elements. A fairly refined description of the tower geometry allowed a thorough examination of the interaction between the characteristics of the motion transmitted from the ground and the damage mechanisms of the tower, which may include crack patterns related to the second mode of vibration and the collapse of the belfry. The results of modal analyses highlighted the extent to which the soil deformability modifies the shape of second natural vibration modes of the tower. A relevant reduction of the high frequency content of the vertical component at the base of the tower was also observed, especially in the case of a more deformable soil. 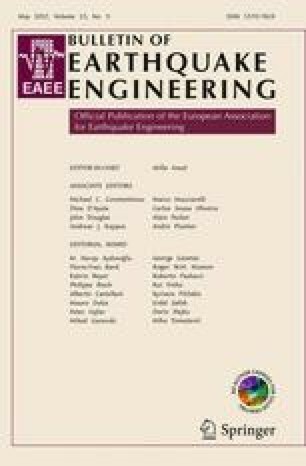 In the non-linear dynamic analyses, a constitutive relation with plasticity and damage for the walls material was assumed, while as forcing actions, the strong ground motions recorded in Mirandola during the shock of May 29, 2012, and in Gemona during the Friuli Earthquake on September 15, 1976 were assumed. These analyses allowed us to investigate two main issues: (1) the capability to take into account the higher vibration modes, which tend to have a relevant role in the damage of the upper part, especially the tower crown and belfry; (2) the specific effect of the vertical component of ground acceleration, usually considered quite relevant for this structural typology. The damage scenarios obtained in a condition of deformable foundation soil resulted different from those obtained in the hypothesis of a fixed base support. In this case, the resort to non-linear dynamical models, which also include a significant volume of deformable soil, is recommended in order to perform an accurate assessment of damage scenarios.